30 23 Photographs mostly by A Briquet, Waite and Cox & Carmichael Photographs approximate size 18x13 cms. Original cloth, 26,5 x 21 cms. The photographs are very rare and very few can be traced in Californian libraries. A. Briquet, Charles B. Waite and Cox & Carmichael worked in Mexico and California. Each of them made a reputation as photographers of popular Mexican costumes. Briquet arrived in Mexico from France in 1883 where he has been regarded as the first commercial photographer. The Californian Charles B. Waite arrived in Mexico in 1896 and left in 1913. He is regarded as one of the most prolific photographer of Mexican themes at the end of the XIXth century. 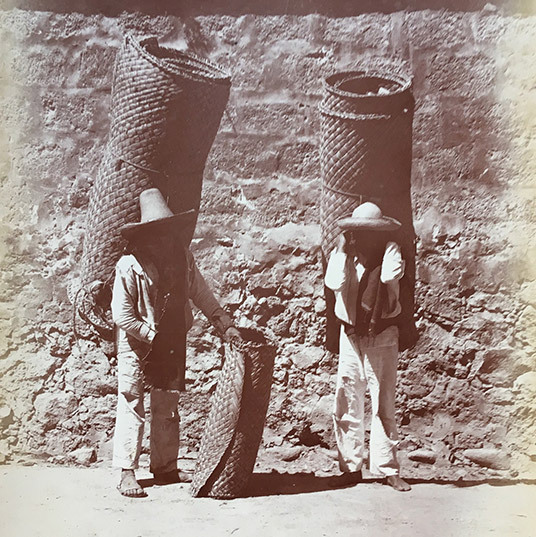 Very little is known of the American photographers Cox & Carmichael who were also active in Mexico at the end of the XIXth century.